I'm not scheduled tomorrow. I'll be in Thursday, no matter what. I won't volunteer, however. I used to do that, until I found out that while I didn't get time and a half because I volunteered to come in, others that they had to cajole to come in got time and a half. No more nice guy. But I do pack a bag of clean underwear, jeans and a tee shirt and personal items all winter. The hospital can find scrubs if they want me to work. If they want me to come in, they better have me scheduled or be willing to pay. Can Nursing student working in a Doctors office draw blood? It will vary by state. In Kansas you would be considered to be working under the physician's license as long as your are working in his/her office/clinic. Just draw a clear line between your job as a phlebotomist/patient tech (or whatever you are called in your work arena) and your position as a nursing student. It sounds like a great opportunity to learn! what do u say to pts when they ask where u live? Like Christine, I give a vague answer; Over by _____ school, on ____ street. Never an exact address. They are just trying to make conversation and "place" me in the community. I often get asked my husband's name, too. We don't have a listed phone, so I'm comfortable doing that and quite often they know him. My thoughts and prayers to the families/victims of this tragic event. May they not die in vain-perhaps some change in regulations, in construction, will come from this to prevent a similar incident in the future. May their souls find peace. 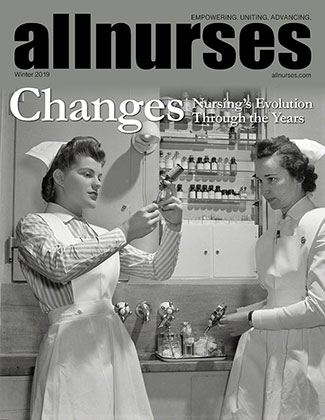 I believe that nurses SHOULD have a BSN and that gradually we will see that change. If most computer charting is like ours, I see the nurse getting further and further from the bedside. I've found that in the last three years I've moved from the bedside to being in front of a computer or on the telephone most of the time. We are beginning to be treated like fast food workers-sent home if the census has been down for an hour, called back when it gets busy. There is no perceived value in our role as nurses by the hospital administration. I see nurses as becoming pseudo-administrators; visible on the floor, but doing the increasing load of paperwork to a point that the bedside care is provided entirely by staff with minimal education and even less leadership. It makes me sad. It also makes me concerned; I have approximately ten years until retirement. I will be one of the patients being taken care of almost entirely by aides, with orders from a physician that have passed through so many people/computer programs that the intent of some of the orders will be misunderstood, misinterpreted, or lost by the time it reaches the bedside. My world will be controlled by protocols that don't take into account the differences in individuals, with testing that has been done primarily on white males. I just hope my daughter will be able to take care of me if the need arises; I don't want to be in the medical/social services system a second longer than I need to be. My name is Elle...and I have a cat. Lol. Cause for HUGE blisters on feet? Just curious. Did he have SCD's on at any time? We've had several patients lately who have developed large, fluid-filled blisters on the top of their feet; we think it is the SCDs. Do give up your seat for a doctor? I guess I'm "old school" because yes, I will. Our doctors put in long hours and need access to the patient records. We have one computer for the doctors, and usually 4-5 doctors on the floor at the time. I do my assessments and take notes on the condition of my patients until I have access to the computer. If they are not actually using a computer they will usually move to another area of the nursing station. They try to respect our access to patient information and we try to respect their time constraints. "God Help You. You're on Dialysis." I was a dialysis nurse for three years (in-hospital, not chronic). There is a place for dialysis, there are patients who benefit from dialysis and even some who recover enough kidney function to resume a non-dailysis lifestyle. The difference between the US and European care is partially due to access. In Europe they consider the person's age and overall health. In the US, if the kidneys aren't functional, you have access. It's hard to say that 75 or 80 or even 90 should be a cut-off age; many people are leading productive lives at those ages. But the US as Europe has done, will need to learn to limit care. As uncaring as it sounds, we need to limit any treatment to those that can potentially be helped. I had been an oncology nurse before becoming a dialysis nurse (same community); it was amazing how many people were "saved" from cancer at the cost of their kidneys and their lifestyles. I dont' have answers; I'm just saying that, as a society, we need to realize that we must spend our healthcare dollars in the most effective manner. For some, basic treatment, then hospice, may be the better choice. Post op Admissions During Shift Change? I work surgical, ortho and peds. Most of our pediatric patients are respiratory. We occasionally have a tonsilectomy that the physician wants to have watched overnight or an appendectomy, and a fair number of viral patients that need supportive care (usually for Dehydration). Ortho is mainly ORIF or Total hip replacements, total knee replacements. There is the occasional broken wrist, ankle, or shoulder. It is rare for us to have a younger person (under forty) stay overnight. Most rotator cuff repairs seem to be going home now. We see a lot of various abdominal surgeries-lap choles, lap appendectomies, hernia repairs, bowel resections. An occasional Nissan. Also I&D's of boils, abscesses and the like. TURPS, treatment of kidney stones (a variety of possible procedures with that). One of our surgeons does Lap Bands. We get most of the hysterectomies, Women's Services gets most of the other OB-related surgeries. We get masectomies. And we get the amputations (usually diabetics), the drunks with lacerations, the motor vehicle accidents who are in for observation, anyone with suspected head injury. Supportive care-insertion of long-term IV access, PEGs, etc-may come to the floor if the patient is unstable or has a chronic condition that must be treated medically at the same time. We also give outpatient IV antibiotics and blood, outpatient wound care, weekend shots, etc. Dialysis can (but does not have to) remove fluid from the circulatory system. Most patients are assigned a "dry weight" that is the weight the patient should be when he/she comes off the dialysis machine. I don't know where the fluid in the bladder would have gone-did you ask the patient if he/she voided? Any fluid lost during a dialysis treatment can be replaced if the patient is at his/her dry weight. Could this have been a blood transfusion reaction? My one experience with suspected blood transfusion reaction was from an autologous infusion. I called the physician, who insisted the blood should continue. After conferring with the house supervisor, I followed protocol and stopped the infusion. After talking with the patient's husband, I realized the patient had an auto-immune condition. This is why she had elected to use her own blood. I've forgotten which part of the blood was involved now (this was probably five years ago) but by giving the patient her own blood, I increased the volume of the portion of the blood that her immune system reacted to. Thankfully, Benedryl and Tylenol were effective. And it was verified that it was her own blood. What are your favorite nursing CEU sites? I like inexpensive/free, so I use Medscape and PowerPak most often. I'd like to expand my list to include a variety of sites.